The Doctor’s friend Benny is enjoying her holiday in the same town. But then she meets a future version of the Doctor, and things start to get dangerous very quickly. With the Doctor she knows gone, and only a suffragette and an elderly rake for company, can Benny fight off a vicious alien attack? And will Dr Smith be able to save the day? An adventure set in Britain on the eve of the First World War, featuring the Seventh Doctor as played by Sylvester McCoy and his companion Bernice Summerfield. 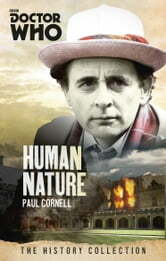 This book was the basis for the Tenth Doctor television story Human Nature / The Family of Blood starring David Tennant. Fans of the New Series will no dobt be familiar with Family of Blood/Human Nature. This is a million times better. From the delicately written romance to Bernice and her friends- and we finally get the genesis of "don't let me eat pears"! The ending is tense but somehow heartwarming. Definitely worth a read!